Ten years ago, a debut crime novel was published. When I picked it up in the library I was intrigued, and so I brought it home. When I began to read I was captivated by the story, impressed by the quality of the writing, and just how much there was to the book. That book was ‘Into The Woods’ by Tana French. It wasn’t perfect by any means, but it was so very, very promising. I had to buy a copy to keep, and I have loved watching the author do that same thing in so many different ways in the books that followed. There have been six books to date; linked, but not quite in the way series are usually linked. Each book is centered around a member of the Dublin Murder Squad, who has usually appeared in an earlier book before becoming the protagonist of their own story. A story that will usually draw out their own story as well as the part they have to play in the investigation of a crime. It is as if the author was walking among them, with a perfect understanding who to draw forward and who steer towards the shadows. This time she makes the simplest of switches and it is wonderfully effective. The two detectives at the centre of this story are the two who were at the centre of the last story. Then, Steve Moran, who was angling for a place on the murder squad, and Antoinette Conway, who already had her place there, had met and were working together for the first time; now nearly a year has passed and they are professional partners. Then he was at the centre of the story; now she is. That may sound like a small change – and maybe it was- but it allowed me a much greater understanding of each of them. Antoinette Conway had seemed so cynical, and now I began to understand why. Steve Moran got on with people, he had an easy charm; but I began to think that maybe he sometimes used that, calculating the effect it might have. A different kind of cynicism. They were left on the fringes of the squad, dealing with the dull routine work. Because Conway had never been accepted, and because Moran had been partnered with her. The case that fell to them at the end of a shift seemed routine, but they were both pleased to have a case of their own to work. Aislinn Murray, an attractive young woman, was found dead in her own home on a Saturday night. Her table had been set for a romantic dinner for two, but that dinner would never leave the kitchen. She had been struck in the face and she had fallen and hit her head on the fireplace. There was no sign of forced entry, no sign that she had been taken by surprise. And so it seemed that her dinner guest had killed her – maybe deliberately, maybe accidentally – and fled the scene. All they had to do was find him. Detective Bresslin, who had been assigned to oversee their work, wanted them to do just that and close the case as quickly as possible, so that they could all get on with other things. When Conway and Moran they meet Aislinn’s friend Lucy they realise that the case may not be as simple as that, and that there would be much more to Aislinn’s story than anyone had realised. Conway was sure that she had met her before …. The story follows every detail of what happens, and I was fascinated. I had ideas, but those ideas and my feelings about different characters shifted as new facts came to light. I really wasn’t sure where this was going to go, how the story was going to play out until the very end. This is a big book for the story it holds, and I can understand why some people wouldn’t like it, but there are many reasons what I did. Antoinette Conway’s narrative voice is perfectly realised, and she became a very real, very complex woman. She could be infuriating and I couldn’t always agree with the things she said and did; but I understood that she had her reasons and I understood what made her the person she was. She carried me through the story. This case changed her, and changed things for her, as is often the way with Tana French’s lead characters. Every character who passed through this story was well drawn. The dialogue, the settings, the atmosphere – every element in this book worked, and that allowed the story to live and breathe. I loved the way that themes were repeated through the stories of the detective and the victim. Each of those stories held some improbabilities, but they were credible and they said much about the issue and the choices that young women can face in the world today. I’m avoiding details, because I don’t want to spoil the story, and because it is so much a whole that it is difficult to pull things out and have them make sense on their own. The book works so well, as a police procedural and as a human drama; and it says what it has to say about the world very well indeed. I hope I won’t have to wait too long for the next one. I usually avoid contemporary crime novels as I tend to find them too unsettling for my tastes. (Somehow everything seems much less threatening when it takes place in an earlier era!) Nevertheless, I think a close friend of mine would enjoy these Tana French books – she loves a good crime series so I shall pass along your recommendation. This does sound like a very good example of its kind and I’ll remember this to recommend to people. Great post. 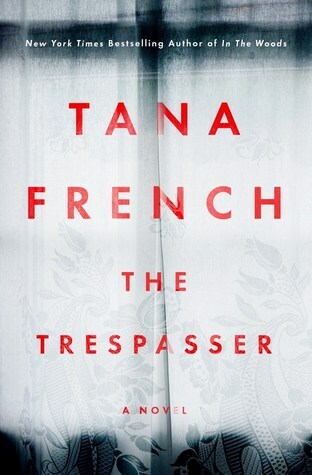 I really like all of Tana French’s books – I’m fascinated by how she writes about friendships, relationships, ties and attachments. This sounds great. I read The Likeness years ago and absolutely loved it! Great review, thanks.